Diwali is known as the festival of lights. It’s a festival celebrated across India which indicates how light wins over the darkness; meaning how good triumph over bad. Do you know the word Deepavali itself means ‘row of lamps’. Therefore people lit up their entire house with diyas (earthen lamps) and lanterns. Over the years the technology has influenced the way in which Diwali is celebrated every year. As per the traditions, it is ‘diyas’ everyone uses to decorate their house. But now things have changed. People started using modern lightings, flameless lamps and even floating lanterns as a part of Diwali celebrations. Those who are really passionate about crafts and arts or love decorating their houses regardless of any functions are the most awaited people to celebrate Diwali. For them, Diwali means working on their passion. 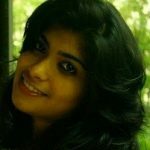 They work on their best to come up with creative and innovative ideas to decorate their house. This time give a chance for all the creative little ones of your family to show off their skills. 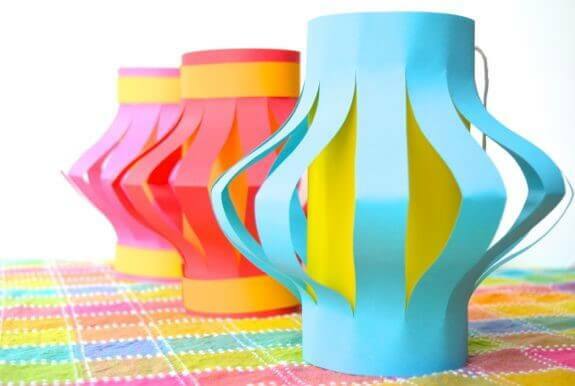 Here is a tutorial of making easy and beautiful paper lanterns, just for kids. 2 sheets of colorful papers. Both of contrast colors. 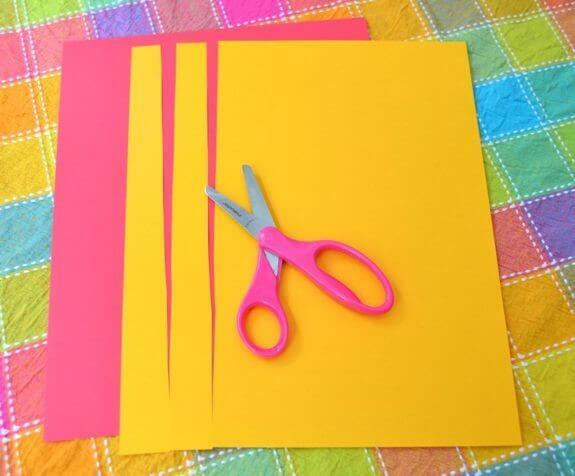 Begin by cutting out 2 strips of 1 inch width from one sheet and keep them aside. 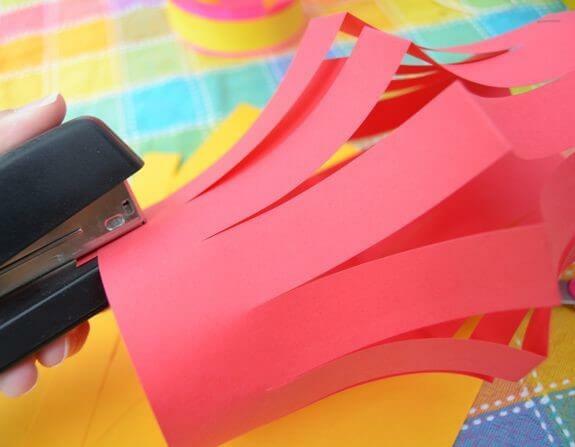 You can also cut one more strip if you want to use it as a handle. Now take the other sheet and fold it in half. Then, start cutting slits from the folded edge to other end, but leave 1 inch margin at that end. So tell your kids to be careful, not to cut the edges. 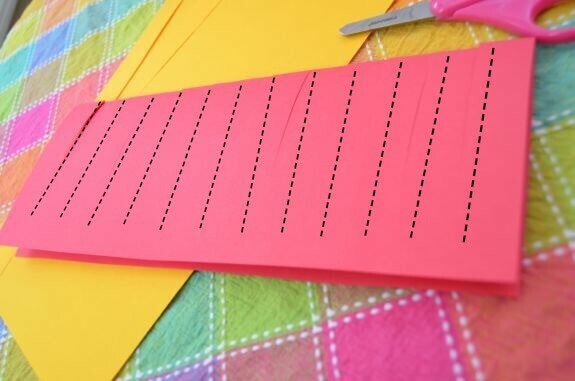 If your kids are too small to handle scissors or if they don’t have any previous experiences in cutting and crafting, you can draw straight lines with pencils on the paper. This will help them in cutting them straight and they won’t cross the border of the margin. 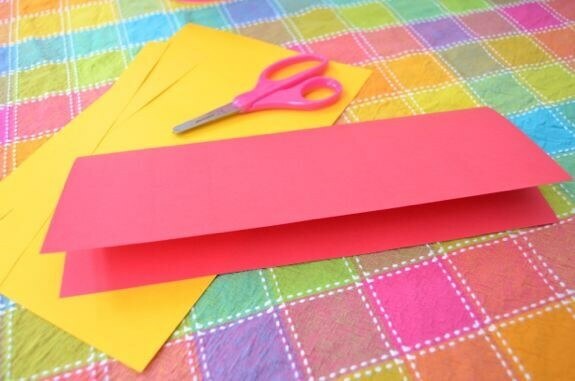 Now unfold the paper and roll it into a tube. It is now the duty of scissors or double sided tape to keep them in shape. So use any of them to keep the overlapped ends together. Teach your kids, how to use stapler if they are trying it for the first time. Take the other sheet of paper, roll it and insert inside the lantern as shown in the picture. 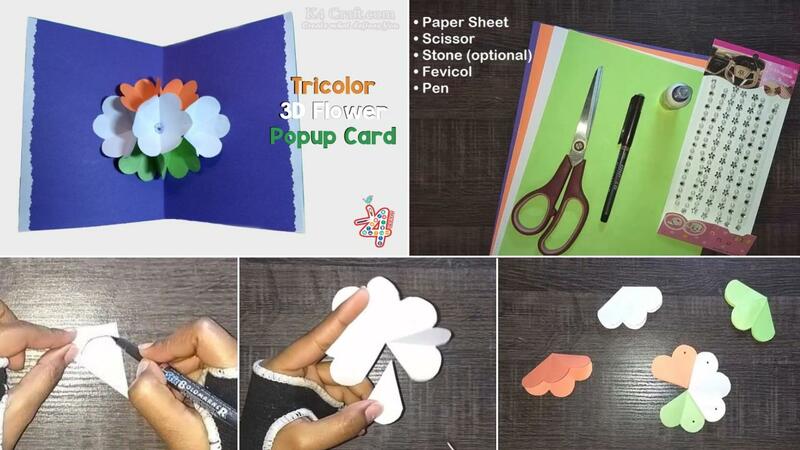 You can finish making the lanterns by using the strips of paper which we cut in the beginning to decorate both the edges. You can also attach the third strip of paper (if you have) to hang them on the walls. Otherwise make it simple by placing it on the table or over the shelves. Make sure to use flameless candles. 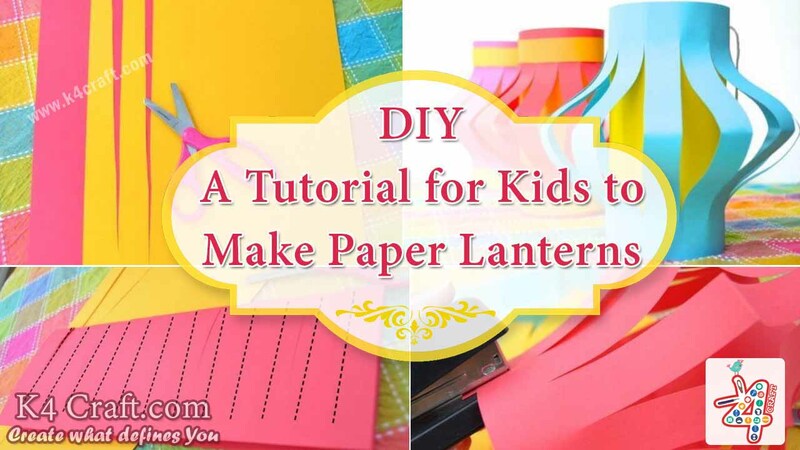 Place them inside this paper lantern to make it glow in the dark. 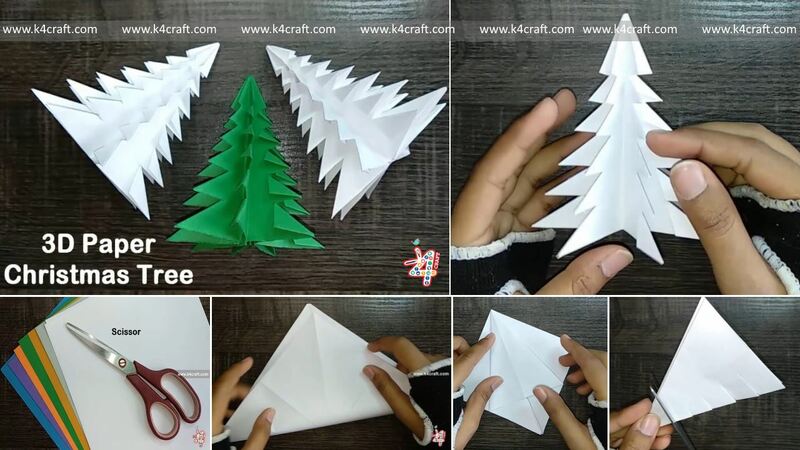 May your kids enjoy this festive season by creating their masterpiece craft works. But do not forget to appreciate their efforts. Remember arts and crafts are good for their development and in promoting flexibility. 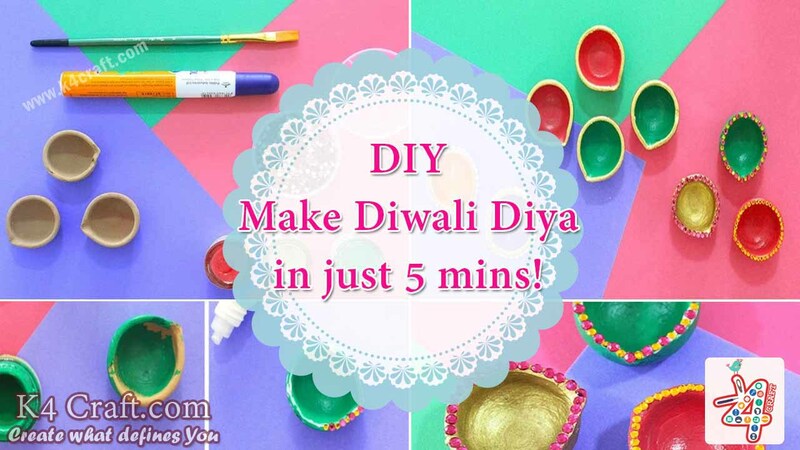 DIY: Make Diwali Diya in just 5 mins!